beetle under one of our end tables. This is a horned passalus, I believe. This shot is the detail of the lower left front leg. Talk about armor! Nikon PB-6 bellows at approx. 150mm bellows extension. These things have a distinctive head, right? Any chance of shooting that for us? can get in the way! I hope to post in a while. Here is a head shot. Nicely shot, and indeed very interesting! But now I'm wondering about the ID. The other pictures that I see labeled "horned passalus" seem to show a single large forward-pointing horn, instead of two large backward-pointing horns. The antennae also look much different. 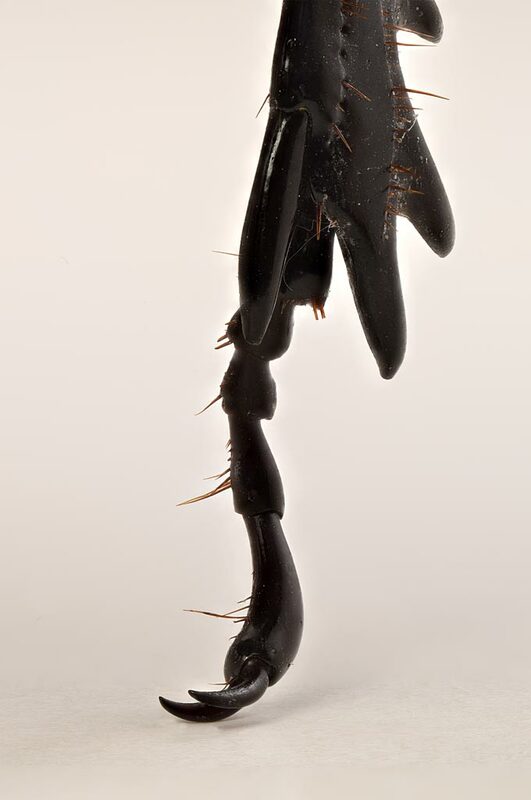 See for example http://entnemdept.ufl.edu/creatures/misc/beetles/horned_passalus.htm (scroll down to "A single, curved horn points forward on top of the head and between the eyes") or the several pages of images at BugGuide. Can you show us a picture of the whole beast? I am sure I probably misread the data that I thought identified this. No hurries, of course. I'll just be curious to see what the whole of this beast looks like. At the moment (after much searching!) 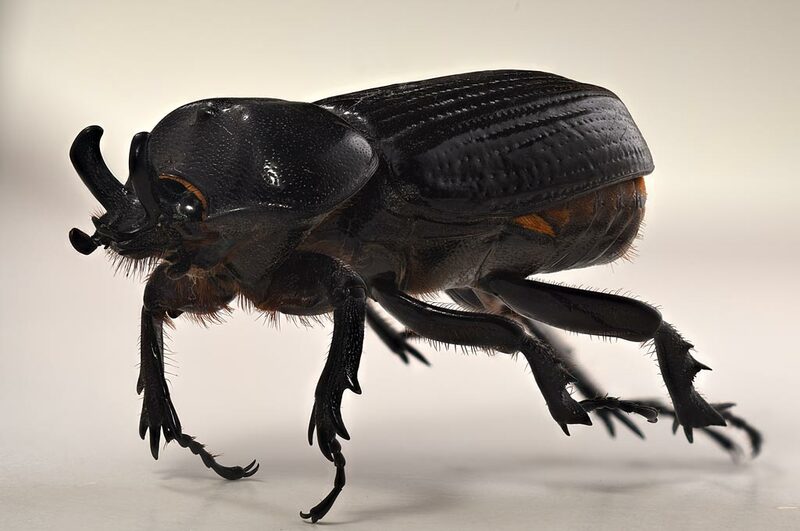 I would place a modest bet on the "Triceratops Beetle", http://bugguide.net/node/view/4705/bgimage. It's the only thing I can find that matches up with what I can see in these images so far. But still there are some structural aspects that I'm not completely comfortable with. Thanks, Mike. This makes me comfortable with "Triceratops Beetle", Phileurus truncatus. I was a bit concerned with the shape of the front of the prothorax in the earlier shot, but the rest of the beast seems completely consistent with P. truncatus and the prothorax seems within normal variation shown in BugGuide. The horns on the head are distinctive and don't match anything else I can find. Phileurus is a tiny genus, only two species in your area and the other one doesn't look like this. I would be interested to know what reference you used to ID this beast as a Horned Passalus. But offhand I can easily understand the confusion. 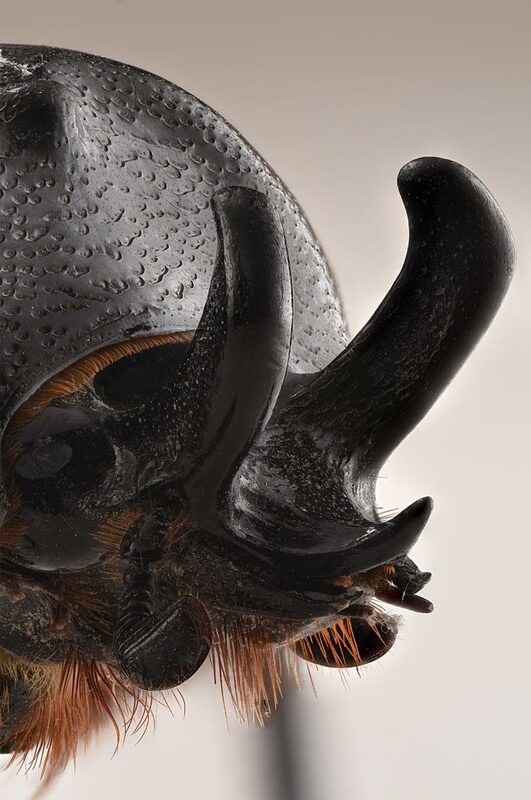 There aren't a lot of beetles that have horns at all, and while the structures of the horns are much different, the two species look very similar in photos that are not good enough to make those clear. of it from different perspectives.